Point of Contact: Jeff Lewis, Sunbury Municipal Authority, (570) 286-9650, jelwissma@ptd.net Project Description (project details, duration, etc. ): Initially built in 1952, the Sunbury flood protection system currently consists of 2.6 miles of floodwall, 2.4 miles of earthen levee, 6 pumping stations, 6 closure structures, 9 drainage structures, and 3 gage stations. Since 1993, when the Sunbury Municipal Authority took over operations and maintenance of the system, the Authority has worked to eliminate or reduce the size of the 7 closure structures that existed at that time. 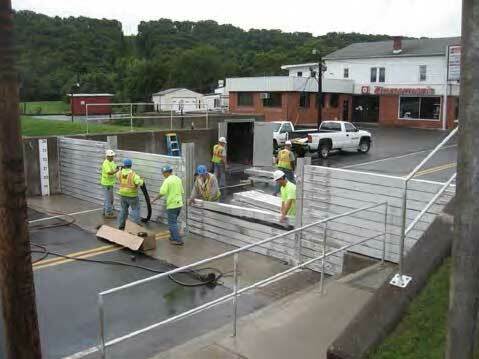 The Authority has also rehabilitated 2.5 miles of floodwall, developed a comprehensive maintenance program for all pumping stations, and implemented a quarterly valve exercising program. Issues Encountered: None Funding (cost, funding stream(s), etc. 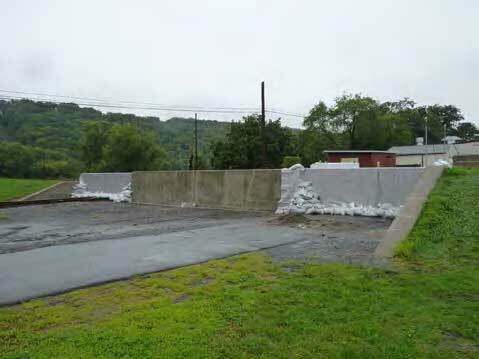 ): Have received more than $1 million in Hazard Mitigation funds since 1993 to eliminate one closure and to reduce the length of other closures by 140 ft. The funds have also been used to retrofit existing closures with easy to assemble components.